Jhonas Enroth, king of Instagram, has a new mask for the upcoming (hopefully) season. It happens to be totally awesome. 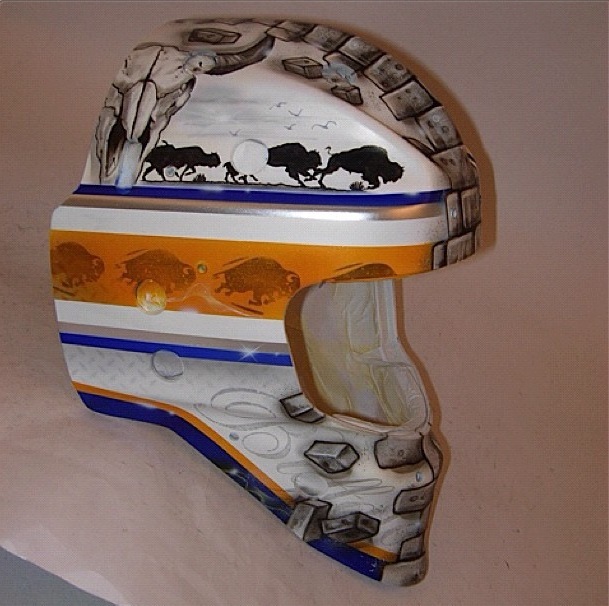 Enroth uses the world’s best helmet artist, Dave Gunnarsson (daveart), and has yet to disappoint with any of the artwork he has worn during his time in North America. His newest lid is a thing of beauty, perhaps the best helmet he will wear at this point in his career. The brick wall art remains down the middle of the design with the Sabres primary logo prominent on the left side. On the right side is a combination of the jersey stripe form the white uniform, silhouettes of bison, Buffalo scripted on the chin and a badass longhorn skull. Aside from providing the most vivid, sharp artwork on a mask, Gunnarsson’s specialty is working stripe patterns into his masks. This instance makes the blue, silver and gold stripes a focal point of the right side despite being the most basic portion of the artwork. The buffalo from the primary logo adorns the gold stripe while silhouetted bison run above the upper blue stripe. Gunnarsson also worked a diamond plate pattern near the chin. However, the longhorn skull does it for me. Despite being relatively obscured towards the top of the helmet, it reminds me of a mask once worn by Grant Fuhr during his time here. 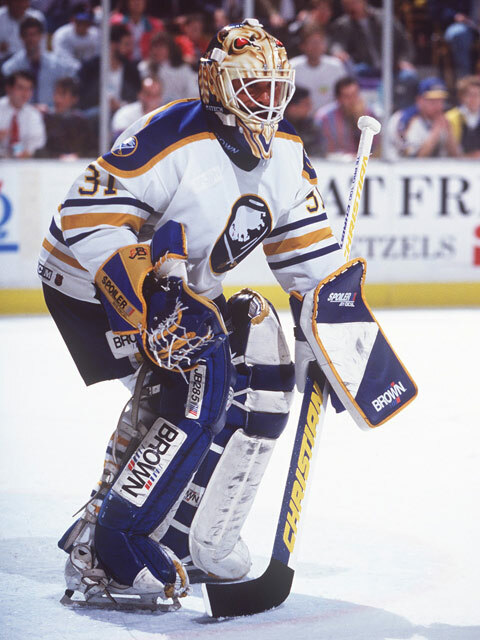 That mask that Fuhr wore was my favorite Sabres mask of all time. Combining this mask with the white bison helmet that Ryan Miller will wear ought to give the Sabres the best one-two punch of helmet artwork in the league. Previous Article Conjecture department: Could a lockout benefit the Sabres?